Nobody can eat at a restaurant all the time, not even The Restaurant Dieter. The new Weight Watchers program really pushes members towards what my meeting leader calls “real food.” So the trick is to eat the right things when you can at home. 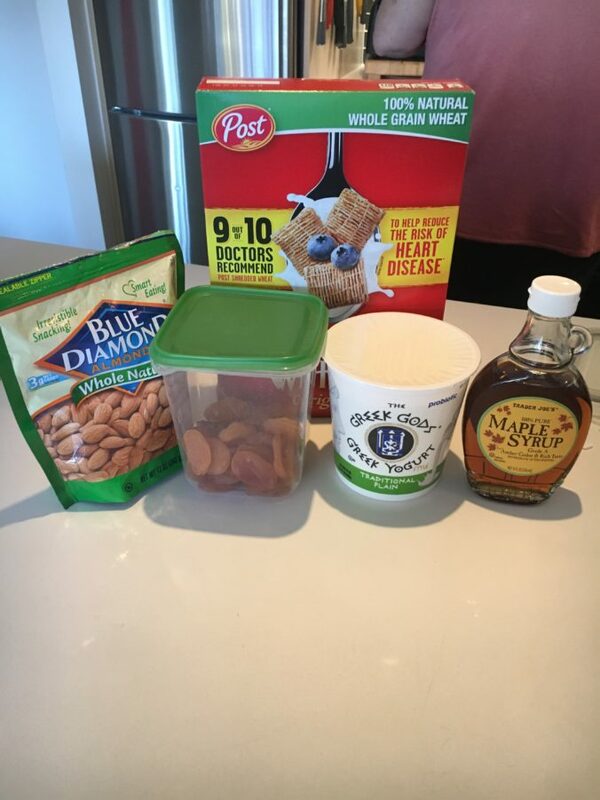 Today’s breakfast was 1 cup nonfat Greek yogurt, 2 teaspoons real maple syrup, 1 ripe diced pear (from the Harry & David gift box that arrived in Friday’s UPS delivery) and 1/2 cup mini wheat squares for a grand total of 7 points. A really satisfying breakfast. Free food is a trap. Who doesn’t love it? Wanting it must be baked into our genes, some kind of holdover of our caveman era. 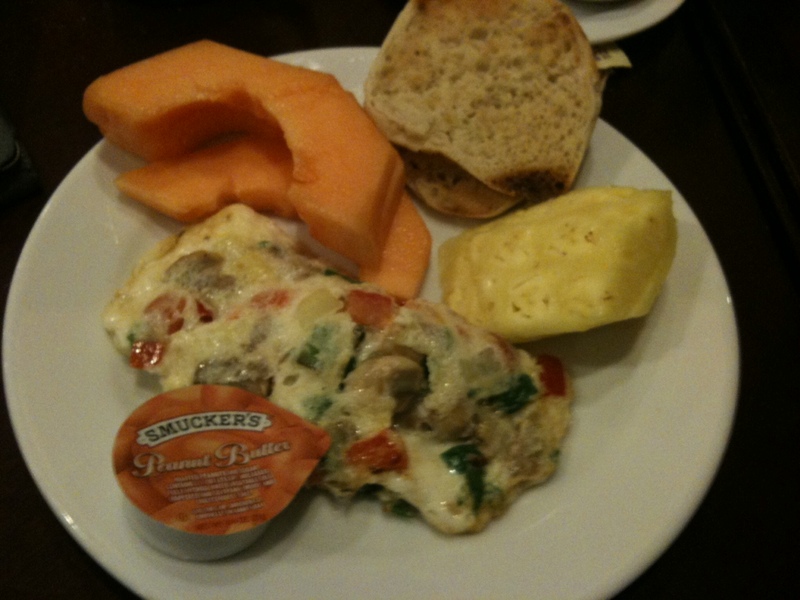 For years, Delta’s SkyClub had bad, sweet, gelatinous yogurt and carbs like huge, bready bagels and muffins for breakfast. 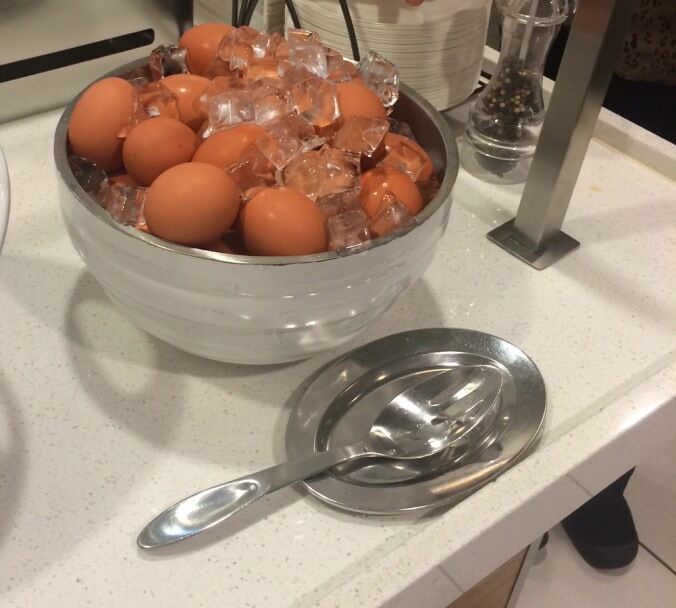 But recently it switched up the menu, offering hard cooked eggs, unsweetened fruit and Chobani yogurt. A mere 4 Weight Watchers points and I’m ready for the day. For a place named for eggs, there sure are a lot of carbs on the menu at Another Broken Egg in Atlanta: in the Monster Cinnamon Roll, in the pancakes, in the French Toast. 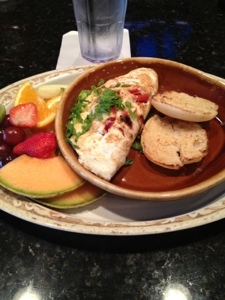 The egg dishes lean toward the decadent, too, as in the lobster and Brie omelette. Gotta please today’s public. But there is a “healthy side” menu with a fruit plate, a skinny omelette, salmon salad, granola fruit and quinoa. Just what us folks on Weight Watchers need. The waiter didn’t miss a beat when asked to skinny the omelette more: cut the goat cheese and the roasted garlic cloves (not that the latter are fattening) and use cooking spray. It arrived as requested and packed with red pepper, green onion and asparagus. 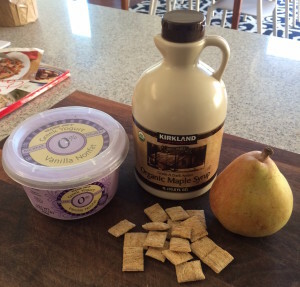 The fruit on the side was a nice melange, including kiwi. The only off note was that the English muffin came buttered. One could knock the waiter for not asking; who asks for cooking spay but wants buttered toast? I have no doubt it would have been replaced free had I asked. A grandfather and grandson were surprised by the pulp in the grandson’s orange juice. The very same waiter took it away and replaced it with apple. No charge. Carb temptations aside, this is worth another visit. This was $18 plus tax and tip? You’re kidding. 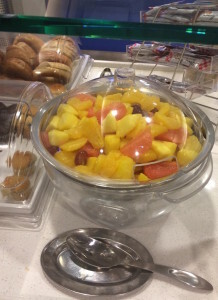 Eating breakfast on the road is an exercise in what a long-ago presidential candidate once called “fuzzy math.” No matter how you try to assemble a healthy breakfast, it’s 20 bucks. And because Americans are value conscious, we want to get our $20 worth. As much as I’ve traveled, I’m still naive enough to see if I can assemble my normal breakfast from the menu for a tab that’s smaller than the buffet. Oatmeal ($8), fruit ($6), tea ($3), one egg and four egg whites (not even listed). So that’s at least $17 before the eggs and the buffet is….$18. Which means facing the buffet, which invariably holds, in ranked order of danger: made-to-order omelets loaded with meats and cheeses, fried potatoes, bagels the size of your foot with full-fat cream cheese, French toast, pancakes or waffles in a pool of butter and syrup, bacon, sausage — what the heck, both if possible. I’m going to copy this blog post to the Marriott Hotels & Resorts, which operates the hotel in Portland, Ore., where we’re staying, in the hope that someone will respond to this question: Why are realistic a la carte prices on the menu out of the question at hotels? I can only think of one hotel stay where the breakfast gouge didn’t happen. Dallas’ Aloft hotel had no restaurant at all, just a food shop where cold items such as yogurt, cereal, muffins and bagels, danish, whole fruit could be purchased. A grill offered egg sandwiches on an English muffin with the usual meat and cheese fixings. The choices were limited, but on the other hand, breakfast was less than $6 a day. Other options can be found, but they’re a pain. Sometimes it’s possible to walk to a Starbucks, or there may be a diner in the area. But that means more bother than riding down on the elevator, so the $20 hotel buffet is what you’re stuck with. Unless you want to fall victim to that “well I paid for it” rationalization that invites overeating, one simply has to accept that traveling and eating breakfast usually means wasting money and fending off temptation. Today I limited myself to a vegetable and egg white omelet, an English muffin with 3/4 ounce of peanut butter and pineapple and cantaloupe. I figure it was about 1/2 cup of egg whites, for about 55 calories about a teaspoon of oil (despite my plea for none — 40 calories and5 grams of fat), plus 3/4 ounce of peanut butter or 2 tablespoons for 190 calories and 16 grams of fat. On my Weight Watchers points, both the fruit and vegetables or free, so they don’t count. I wasted a ton of money, obviously, but carried out a banana for a post workout boost. And I showed good judgment, given what the rest of the day holds: tonight is dinner at Beast, a Portland restaurant whose chef was recently featured on the Bravo TV show, Top Chef Masters, with foodie TRD spouse’s equally foodie brother and wife. The place has no menu from which to choose. The menu, all six courses, is what there is to eat, like it or not.